Some time ago I had a quick exchange of ideas with Joe of Brokenpaintrbrush fame. He is doing a fantastic job in bringing all the painters and hobbyist together and if you, by any chance, haven't seen his blog yet - do it now! Joe hosted extremely successful Dreadtober last year where a lot of participants shared the photos of the progress of their various war engines of destruction in the grim future of 40k millennium, when there is only war! I commented back then that it would be nice to have a Fantasy version and Joe challenged me to come up with some nice name for it. That's how the idea of MonsterMarch started! Much as the original Dreadtober, this is to provide an incentive to assemble and paint one of these large models you have but kept postponing the painting part. It may be that the task seemed to be too intimidating. Or maybe you have already started but as such a large model requires more time to finish, the motivation and enthusiasm evaporated before the model was completed. Whatever the reason was now it is a chance to get back to these fantastic center pieces of your armies or collections and give another go. Hopefully the fact that you will participate with other hobbyist in the same challenge will help to maintain the pace. Equally, sharing the photos of the progress would inspire each other to keep going and I certainly believe that any participant will be able to showcase the final stage of their painting and modelling! I have created that account especially for this event so that I can easily access all the details participants want to disclose and collect the photos in one place. What miniature can I paint? There are no particular restrictions or rules. I wanted to start a challenge about broadly understood Fantasy large models - monsters of some kind, ridden or not, from pretty much any system or range you can imagine. In fact, I would love to discover something I have never seen before thanks to your contribution! The idea of the challenge is to have weekly goals to help with progress in assembling and painting. However, they are more like guidelines and a help for me to provide updates about particular stage. But you can always join at any stage of the challenge, finish any part of the miniature at any time that suits you the best. Feel free to provide your own weekly schedule and I will definitely include it in the updates. 1. Official start and presentation of participants - I will collect the details of participants until Saturday 4th March so that I can initiate the challenge on 5th March and present the participants. This the time for you to plan what would you like to paint, add any blog, website address for me to include etc. 2. Assembling and preparing the model - this goal is to be accomplished until 11th March. You should be able to assemble your models or parts of it, depending how you want to proceed with painting. 3. Painting Stage 1 - First week of painting! It will last until 18th March and may be all about basic colors for entire model. But may as well be about the first part you want to paint completely, as I know that large models require different approach too. 4. Painting Stage 2 - Second week of painting, until 25th March! You should be able to add some more details now, start building some definition to different areas or simply keep adding different parts to your model. 5. Painting Stage 3 - Third and final week of painting! It will end on 1st of April and should see you finishing your model! It may be the time for adding a base too but don't worry if you don't! It is all about the model itself. You may want to take a few more photos than usual, presenting the model from different angles. It is the first time for me to organize such a challenge so I really hope I will be a good host! I have a great example to follow as Joe had a massive success with his Dreadtober. 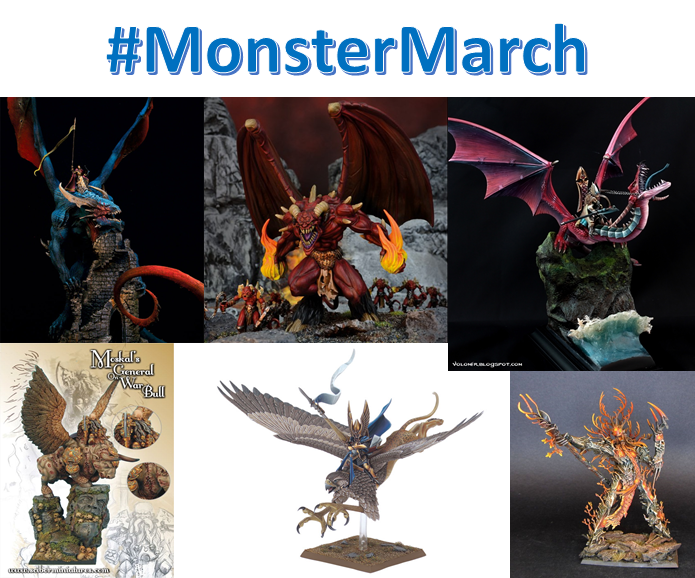 Hopefully we can get nice number of participants so please, distribute the message about MonsterMarch among your friends! Feel free to offer advice and suggestions on the way and if possible I will do my best to implement them! Awesome idea Swordmaster, I'm in! Got a Terrorgheist that has been waiting on some love for a long, long time! I'm going to start a bit ahead though as it has already been assembled and waiting on some paint for a couple of years now. I believe in you! I am sure you will be able to finish your Deathguard just in time to start a new project. But you can also join at any time if things get delayed too! Hmm, I don't think I have a monster/beast needing paint but maybe I could rustle something up. I'm in, I must paint my The Glottkin! Soon I'll shoot an e-mail, great idea! I just signed up. Thanks for setting this up. Lord of Change, here I come! Hey! They are monstrous creatures, it says so in the rules! (before 8th edition comes around and removes all such shenanigans) I'm delighted to have another painting challenge to motivate me through some more models, even if their classification is somewhat dubious. I have a neglected beastie I will return to for March. Seems a great choice for Lent. Perfect! The more the merrier! Do you have any blog or website where you usually post the photos? If yes, let me know so I can add it for people to follow your progress! Hi. I like that idea. Parking now my space marines and a high elf dragon is now on my painting table.